It feels like time runs faster and faster every day. I am pretty sure that each one of us had such a feeling, especially nowadays, when it looks like the tempo of life is trying to compete with the speed of light. So, this phenomenon of accelerating life makes people to consider how to save some minutes on activities which normally take quite a lot of time. Therefore, how will you react if I say that after a certain period of time you will have a possibility to print things you need at a particular moment? It might sound unlikely, but such prediction is highly probable. Yes, at this moment 3D printing is quite an extravagant industry, but everything needs time. Therefore, while waiting, we can go through 10 extremely useful things, which have already been created to make our life easier and help to save our time. So let's take a look at ten items, which are made primarily for USING them, instead of appreciating them for their aesthetics or sophistication. Probably, at least once in your life you came up with the idea that a third hand is desperately needed for you. Or at least you wouldn't mind to have it. I have even thought about fourth, fifth or sixth hand. But okay, everything has its limits, doesn't it? This 3D print-ready model of bag carrier seems like an extremely simple idea, but it is said that genius lies in simplicity and this item definitely proves that. Having such a thing will empower you to have three, four or even five bags in one hand. Unfortunately, despite having such a great item, you will still need to have some power in your hands. So, measure your strength - and two bags in one hand will also be a great success. Early morning. You get out of bed enormously sleepy. You are going directly to the kitchen for a cup of coffee, because you need an ignition. You set on the kettle and slowly move to the bathroom. Suddenly, your somnolence evaporate like the water in the kettle: "I forgot to buy a new tube of toothpaste. Again." You are trying really hard to push the tube, but, let's be realistic; morning is not the period of the day when we are the most powerful. Does such a story remind you something? 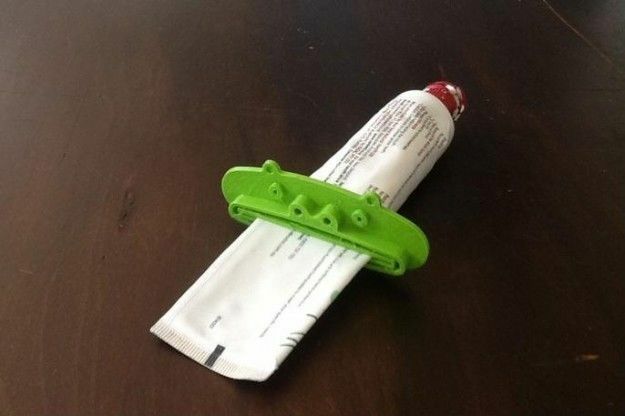 If yes, I believe that this 3D printed toothpaste pusher would definitely find a place in your bathroom. Pay attention, dear reader, if you wait for a summertime every year, because you have a passion for ripe and juicy berries. 3D printing industry has an astonishing announcement for you. 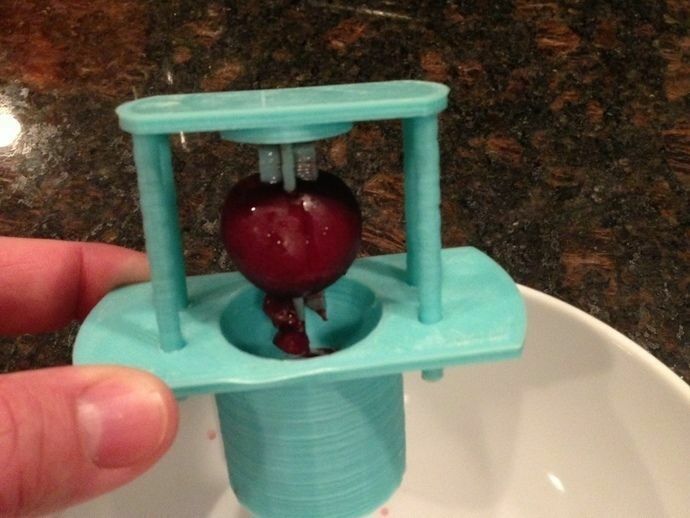 An item, which removes pits from cherries is printed in 3D format and designed by RockStarAlchemist. Having such a small gadget, my home would be loaded with a smell of cakes made with cherries as there's no doubt that this item would save a lot of time! This paragraph is balanced for smokers. The next item which is made for smokers is extremely useful and, I believe, really desired by them. Let's meet the... Case for a cigarette! I am not a smoker, but I can easily empathize with those, who are becoming irritated, when cigarette cracks in a pocket, wallet, bag or even hand. This case, in my modest opinion, is an item, which existed in the smokers' deepest dreams and, finally, was released. Almost everyone of us has experienced the situation when doors have been closed with a huge power because of the strong wind. When it happens for the first time - it's OK - you open the door one more time and go back to your activities. But, when it happens for the second or third time, you get irritated. This door holder is created for helping to avoid such situations. "I had a problem with my doors closing by themselves or when the wind blew etc. 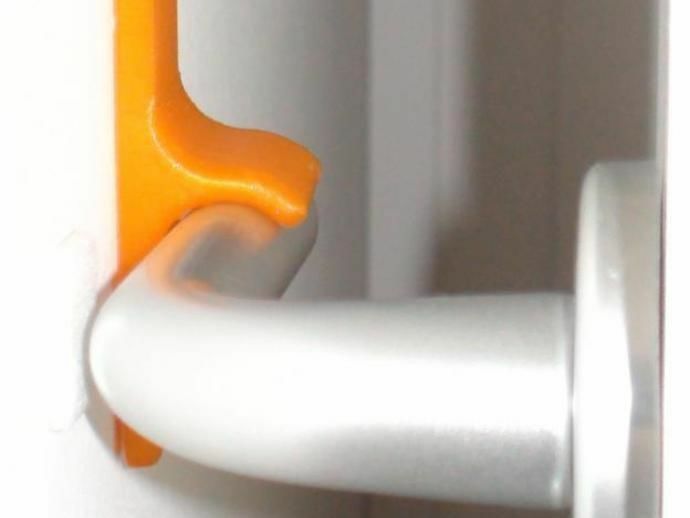 The classic door stopper objects (lying on the floor) didn't work - my children had been taking them away every time,"- says Joachim, the author of this great 3D printed stopper. I believe that these titles may sound like slogans from the marketplaces' advertisements. However, my mission out here is not to make you buy those 3D printed models, but to show you some interesting items which were made by using this technology. 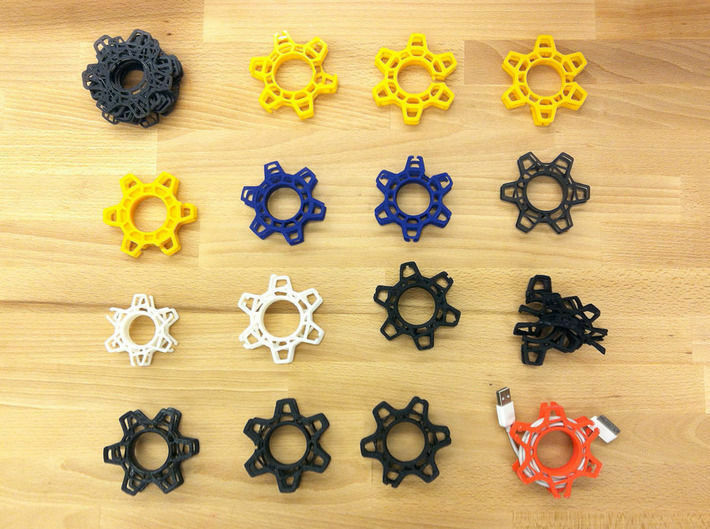 Therefore, our next item is 3D printed shopping cart key, which is definitely useful every time you go to the mall. Yes, certainly it is not a vital thing, but you should admit that having it with you in the supermarket will save a bit of your time, which would be wasted searching for a specific coin to unlock the shopping cart. I believe that you have had cases when you did not have the right coin in your wallet to put into the shopping cart. Of course, it is an extremely small detail, but, actually, such small details sometimes make us really nervous. Item by item we are moving further. Next thing, which deserves your attention, is a power generator cranked by hands. It is important to understand how this thing works. Actually, it is not too complicated and from other generators this one differs just in one case: initial energy is provided by the user's arm. 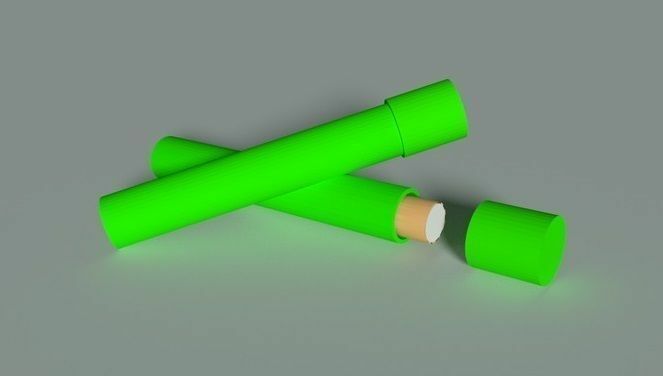 Designer of this item, Even Erichsen, got the 1st runner-up's award in 3D printing competition, organized by CGTrader. The author mentions that the rotor spins upwards to 4000rpm and produces about 40 volts without any load. Congratulations for the success and the best of luck for such a talented designer! Probably there is no need to talk a lot what a gear wrap is. Saying in a short way, this item helps to keep ear buds, charging, and USB cables organized. It is said that cables have a extremely strange quality: it does not matter how and where you keep them, they will always bundle into knots. Designed as an accessory for everyday carrying, it is extremely light and strong. It is a really amazing way to keep all cables in order. Nowadays, when global warming is getting more and more attention and the idea of trying to start coping with it by doing your part is more and more popular, riding a bicycle became a trend. It replaced the habit of driving to work by car. Furthermore, there is one more, let's say, trend in the XXI century - most of the population cannot live without having a phone with themselves all the time. Putting those two trends together is, actually, not the best idea. However, 3D printing industry has created an item, which you can print for yourself and easily combine riding a bicycle with talking by phone or even reading messages. Simple, but extremely useful. If this item reflects your lifestyle, buy this model, print it and use it. Paragraph about this, actually, the last thing from the list, can also contain thoughts about XXI century's individual living in the fast-moving world and that is the reason, which pushes each and every person to switch on a top gear for keeping up with the tempo of life. If your lifestyle is extremely fast and if you are running, literally, rushing and doing everything in a hurry, and, if at the same time, you are trying to listen to music, audio books or talking through hands-free installation, particularly often there occurs a situation that earpiece of your earphones falls out. Probably, this annoyance is quite spread as there appears 3D printed item, which is created to save such situations. Therefore, it seems as certainly great device for people who cannot stand being without earphones. By the way, it was medically proven that earphones can damage hearing more than headphones. So, maybe it would be advisable to consider about that? If no, grab this useful thing and move on the top gear without worries to lose your earphones! So, it seems that ocean of 3D models, which are waiting to be printed, is getting deeper and deeper as the industry is growing in hours. Those 10 things are just few fishes taken out of the water, which you may find useful for your everyday life. But I highly recommend diving into the ocean of 3D models by yourself as it is the best way to find what is needed exactly for you.